Select Tavernier vacation rentals for canal and oceanfront locations. Bring your boat for fishing, boating and family cruising adventures. 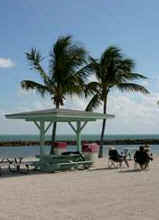 Enjoy the tropical ambiance of a Florida Keys location where a comfortable living style is paramount. Tavernier vacation rentals present affordable accommodations for the entire family or group vacations. Tavernier is the first city south of Key Largo in the Florida Keys. It can be a good area from which to tour northward to Miami and south to Key West. It is small but well equipped to handle visitors because of its shopping centers and good restaurants. Natural beachfront is hard to find in this area because of the rocky coastline but several public parks offer beach access with parking and restroom facilities. Tavernier vacation rentals will be close to all this island city has to offer.